Ivan Aivazovsky’s “Fight in the Chios Strait on June 24, 1770” depicts the events of the Russo-Turkish War of 1768-1774. 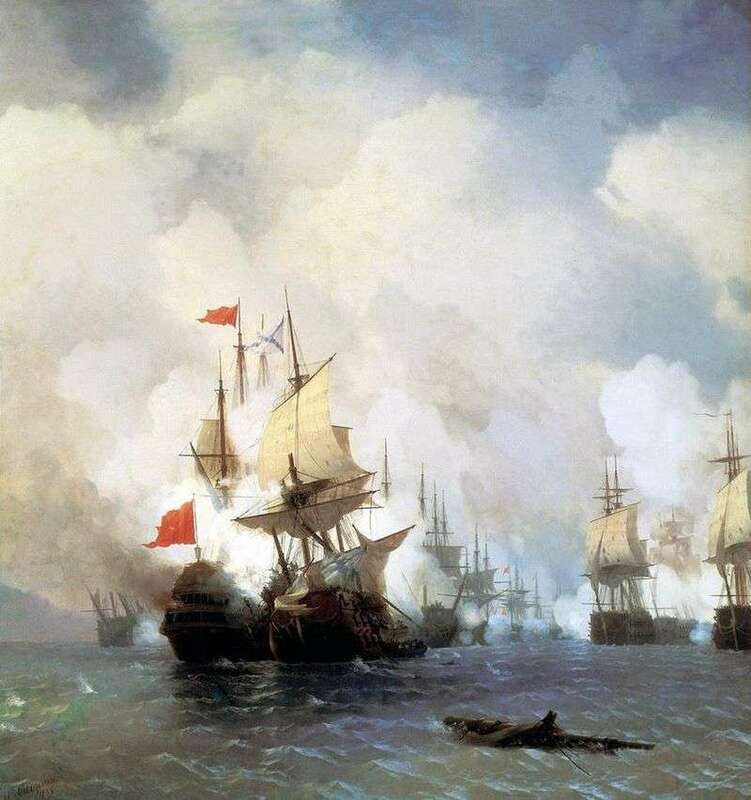 June 24, 1770 squadron of the Russian fleet, headed by Count A. Orlov and Admiral G. Spiridov, discovered the main forces of the Turkish fleet, anchored near the Chesme Bay. Numerous Turkish warships were hidden in the strait to avoid fighting with the Russian fleet. But they could not avoid fighting. The height of the sea battle is represented in the painting by Aivazovsky. Sailing ships of the Russian and Turkish fleet lined up in a line. Weapons smoke from gunshots fogs the ships. In the center of the composition of the painting is depicted the ship of G. Spiridov “St. Eustathius of Plakida”, on which enemy strikes are being struck. But despite this Admiral Spiridov leads “Evstafia” directly to the flagship Turkish ship “Real-Mustafa.” Russian sailors are ready for boarding battle. Outside the picture was the tragic end of the bout. The “St. Eustathius of Plakida” was blown up, and after it the Turkish “Real Mustafa” exploded, after which the Turkish squadron began to retreat to Chesma Bay, where it was blocked by Russian ships. The blue sky covers the smoke from weapons shells. Aivazovsky uses a low horizon in the picture, which creates a greater impression of the greatness of Russian warships. They seem to heave above the sea to the sky. The sea is restless because of the shells. The picture is written so realistically that you feel yourself witnessing those events, you hear volleys of military ships, the cries of sailors. Thanks to Ivan Aivazovsky, remembering the history of the Russian-Turkish war, now the image of his majestic picture will appear in his memory. Description and meaning of the painting Fight in the Chios Strait June 24, 1770 by Ivan Aivazovsky.